My subway stop is the last stop on the ‘R’ Train in Brooklyn, 95th Street. The ‘R’ train goes from my stop at the tip of Brooklyn all the way 71st Ave in Forest Hills Queens. I’ve actually never ridden the whole line to this stop. I hear there’s very good food out that way, but I just haven’t done the trip. I feel there is still time. But I do feel sinful and guilty for not having made a point to travel to all the points on my track. You might think that if you live at the last stop of a subway line, the conductors or the system would try to speed you home during the last leg of your journey, the part of the line where there are no more opportunities to transfer to other lines. In my case, that is the stops between 59th Street, where you can still transfer to the ‘N’ line, and 95th Street. Surely they must feel bad you live so far away. But this is not the case. The train slows down on this last leg. Sometimes there are two trains in the 95th Street Station, and so your train cannot proceed until one train leaves. So the last leg of the trip often proceeds at a much slower pace than the rest of your journey. Time stretches and stretches out further still, and it is not uncommon to feel as if you may never get home. But there are advantages to living at the last stop too. When the doors finally open to let you out at 95th Street, there is no need to hurry out of the car, other than your general desire to be anywhere on Earth but the subway car. 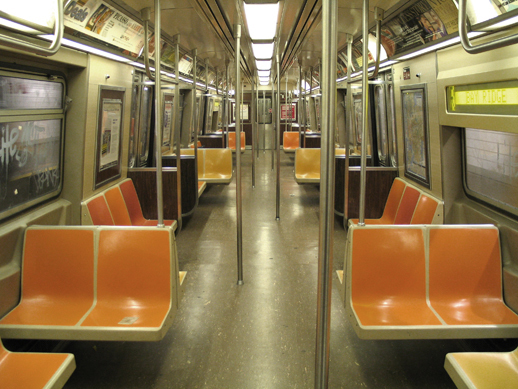 The doors will still be open, and if they do close briefly, they will re-open once more, and your train will still be at 95th Street. The last stop is also the first stop. This means that the trains are cleaned in my station, and readied for their next journey. Granted, “clean” is a relative term in this context, but still, they do start better than they end up. So when you start your journey from 95th, the cars are clean, and your future is bright. When you return, the cars are dirty and you are dismal. The ‘R’ in the ‘R’ train might stand for ‘reliable’. Boring, but reliable. It will get you there. Not very fast. But it will get you there. I guess that has been good enough for me. I’ve never owned a car, and I am not considering buying one now. bay ridge, brooklyn, 3am. We both were awakened by the insistent call. It went on for awhile, and was so absurd in it’s repetition that I got up and grabbed my iPhone to start recording it. It was amazing how perfect the rhythm and timing was – like a stuck record player – over and over and over and over until just as mysteriously as it began, it suddenly stopped. The night birds of Brooklyn are becoming a dying breed, at least in our neighborhood, and we were lucky to hear this one’s song. Still, I’m pretty tired today. 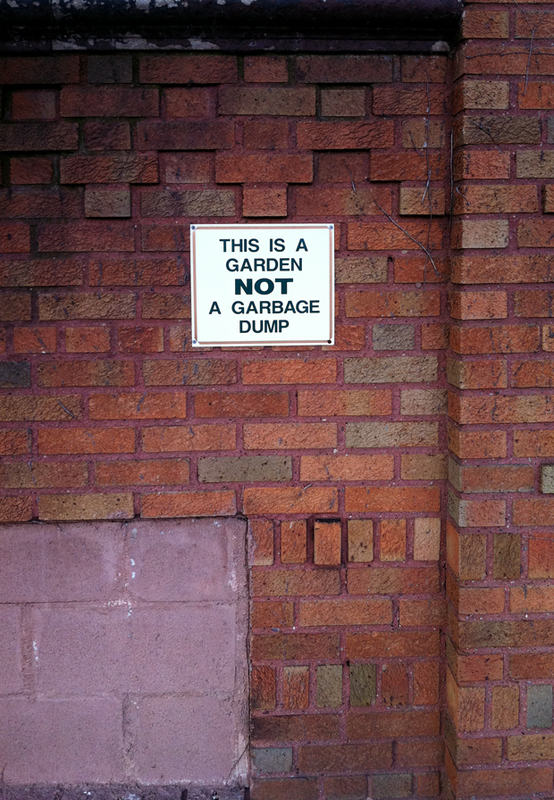 Only instead of a pipe, this image is of a brick wall at a co-op building, and the sign declares that the brick wall is a garden, not a garbage dump. Foucoult must live there. Ceci n’est pas une garbage dump. 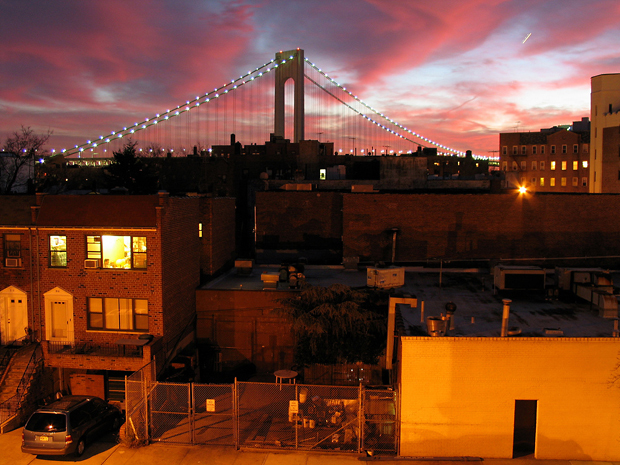 This is where I live now – in the shadow of Verrazano’s 679 foot tall pylons. It’s a great bridge, and a great beacon to my home, clearly visible from even Midtown Manhattan if you look for it from a tall enough building. 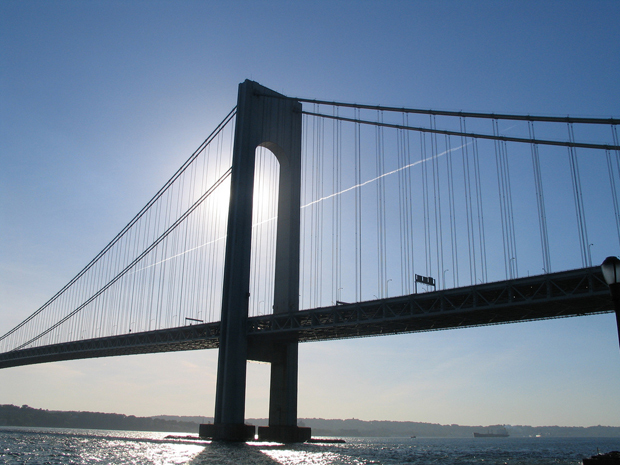 At 4,260 feet in length, it is the longest suspension bridge in America, and it’s double decker roadways clear the water by an average of 228 feet (this height varies by 12 feet between summer and winter). It connects my neighborhood, Bay Ridge, Brooklyn to Staten Island, and unfortunately it can’t be crossed by foot or bike except during the New York Marathon when you can run along the top or bottom deck from Staten Island to Brooklyn, or during the 5 Boro Bike Tour which allows bicycles to go from Brooklyn to Staten Island on the lower deck. I can see it from my house, and it’s always an impressive sight against the different skies of night and day. The fact that it forms a sort of pyramid from the view I have gives it a timeless character beyond it’s inherently powerful minimalist form. There is a pathway that runs along the Brooklyn Shore for two miles in either direction from the Bridge. 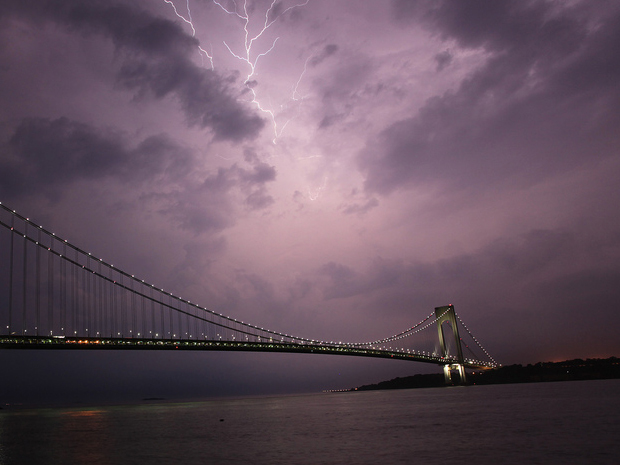 Last summer I was walking along the path when a storm began rushing in and I caught this striking view. If you must build something big, build something really big. Once you hit a scale like this, something transformational begins to happen, and the object gains a presence, and even perhaps a conscious that is unlike other man made structures. It becomes iconic, transcendent, and no longer waits for lightening but calls it forth. I respect accomplishments of this scale, and I’m happy to live so near to this beautiful bridge. PG Child Theme built on the Thematic Theme Framework.